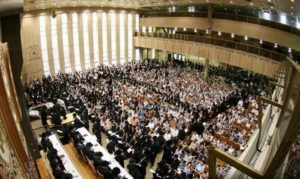 With Klal Yisroel once again facing unprecedented challenges that have swept every segment of the Jewish community, Misaskim is once again coordinating its annual Aseres Yemei Teshuva Tehillim Asifa, with tens of thousands of tinokos shel bais raban joining together in a single voice to beseech Hakadosh Baruch Hu for rachamim during this most pivotal time of year. The Asifa will take place this Thursday, September 13th at 1 PM. Children from more than 35 Yeshivos will gather at the Bobover shul in Boro Park, with thousands more from all over the world joining in via satellite hookup. The program will include the recitation of Kapitellach 13, 20, 79, 121, 130 and 142, followed by Mincha, Avinu Malkeinu, Selichos of Shlosh Esrei Midos and Kabalas Ol Malchus Shomayim. Everyone, regardless of age, is asked to stop whatever they are doing in order to take part in this global effort to bring an end to the tzaros that are being faced by so many in our own communities. To take part in the event, join the livestream at Misaskim.org or call Kol Mevaser at 212-444-1100 and follow the prompts 8 and then 1.